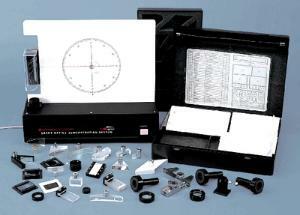 Delivers outstanding demonstrations of over 70 phenomena in geometric and physical optics. This unique, self-contained apparatus is designed to combine great flexibility in producing a wide variety of optical setups with the high image quality necessary for demonstrations or advanced student work. The resulting system is compact, convenient, and comprehensive. In geometric optics, 17 optical components are provided and 49 experimental setups are described, including reflection at mirrors, refraction at blocks, prisms and lenses; image formation in mirrors and lenses, optical instruments, normal and off-axis imaging, and lens defects. The intense rays are easily seen in a lighted room, and the individually adjustable mirrors allow setups to be generated that are not possible with conventional ray boxes. For physical optics, 13 optical components and four accessories are provided. In all, 27 experimental setups are described. Excellent interference fringe patterns are produced for the well-known air wedge, Newton’s rings, Lloyd’s mirror, Fresnel’s mirror and biprism, and Young’s double slit arrangements. Similarly, in the 15 diffraction arrangements, the high quality of the diaphragms supplied results in clean, clear patterns. Experiments introducing Fourier imaging, polarization and laser speckle phenomena are also included. The apparatus centers around the base unit, a metal box containing a 3 mW He- Ne laser and a mirror system to produce a vertical laser beam. Mounted on the box is a vertical plate, 35.5 cm wide and 24 cm high, that supports the beam splitter, turntable, and object carrier mechanisms, and acts as a whiteboard for ray optics. The beam splitter system is mounted on a rack and pinion, allowing for precise vertical adjustment, and is housed in a transparent hood for protection. It consists of five graduated partially silvered mirrors, all individually adjustable, that deliver one to five equally intense beams across the whiteboard. A removable cylindrical lens fitted on the base produces flat fan-shaped beams for ray optics work. Components for physical optics setups are mounted on the base on magnetic stands. A separate component box houses 34 optical components and accessories in fitted compartments. All the lenses, prisms, and mirrors are of precision-ground and polished optical glass, and the diaphragms are formed from vacuum-deposited metal films on glass substrates, ensuring consistently high quality images throughout. The system comes with an extensive manual and a robust storage case. The power cord measures 2 m.